If you missed the first post in the Simple Steps to Begin Cooking Homemade series, we talked about some essential pantry staples that will help you get started cooking from scratch. And this month, we’re discussing one of the most obvious, and probably one of our most favorite aspects of cooking homemade – baking! I’d always loved to bake, and as we began to have children, I realized more and more the importance of using simpler ingredients. Even if I made something with white flour, I still felt better about serving that than I did canned biscuits or pancakes made from a boxed mix that contained ingredients I couldn’t pronounce. Over the years, I’ve replaced more and more packaged baked goods with healthier homemade versions. 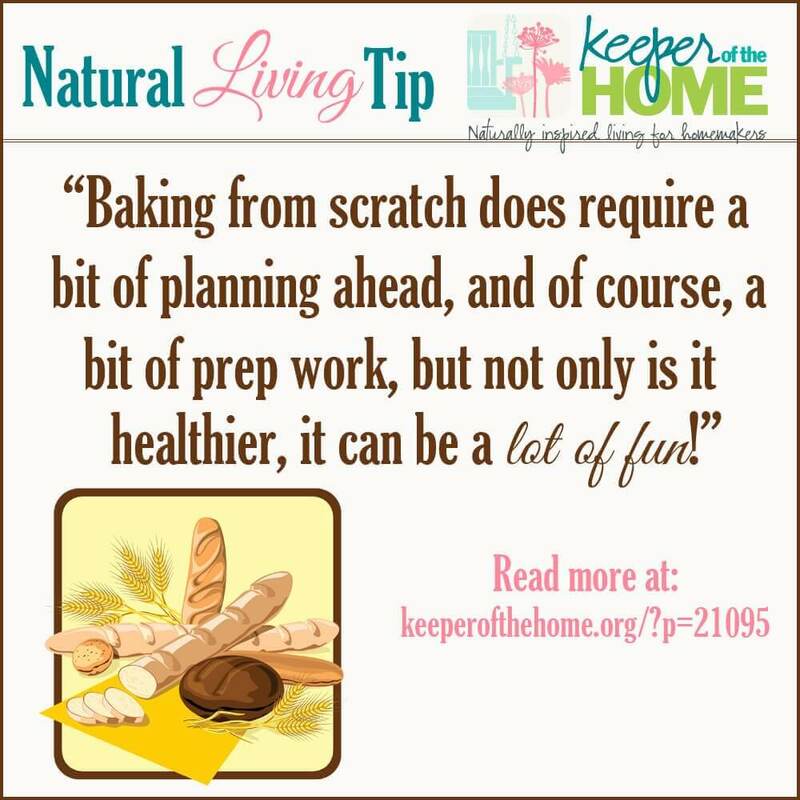 Baking from scratch does require a bit of planning ahead, and of course, a bit of prep work, but not only is it healthier, it can be a lot of fun! Where are you on your real food journey? Do you have a favorite recipe to share? We are still very young in our real food journey. I chose to start with our bread. I make bread several days a week. I love it!! 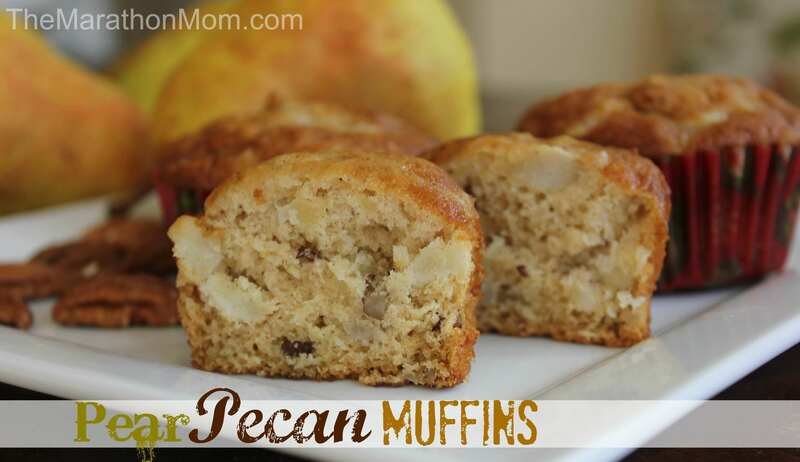 It tastes so good and has only 6 ingredients …can’t beat that! Thanks for this post. I can’t wait to try some of these recipes! I haven’t made crackers yet (although that is on my list to try! ), but I regularly make a batch of muffins and/or cookies each week for us to enjoy for breakfast and snacks. It doesn’t take long at all – I typically mix them up while I’m preparing dinner and then bake them while I’m cleaning up dinner on Sunday or Monday night. 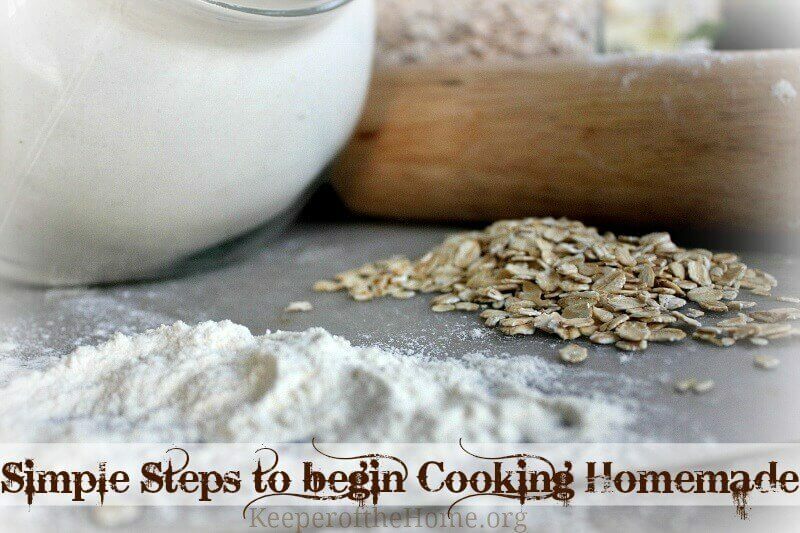 I am loving the easy steps to cooking homemade series!!! My family is nearly brand spanking new to attempting a whole food lifestyle. I am taking small steps to enable us to sustain. Bread would be my next step but I am really intimidated by making bread. I do not have a stand mixer and am not quite ready to purchase one (gotta save some $dough first). Can I attempt the bread recipe mentioned without one and if so any pointers for a first timer…thanks for any and all thoughts! Besides sweets (cookies, muffins, etc. ), pizza dough is probably the first baked good I started making from scratch. I’ll never go back! It can be made quickly and once I figured out how to get the dough to bake with the right texture (I bake it without toppings for a short time, then top it and bake it until done), it became a favorite in my house. I love that I can customize it by adding seasonings while kneading the dough to give it a unique flavor. I’m eager to try the recipe for wheat crackers. I bake cookies and muffins, and make pancakes from scratch. I’ve tried pizza dough once or twice, but I haven’t quite got the hang of it yet. Breads are something I want to work on these next few months. Will be pinning this post for reference. great links – i will check them out! thanks. we do everything homemade. i think homemade naan bread and tortillas are my favorite. 🙂 we also do a lot using sour dough. Hi Brandy, Yesturday I was making pumpkin CC muffins and I did really well with the flour and sugar parts going with healthier on both of these, but then I came to the oil. 1and 1/2 cups. Here is my question do you sub 1and 1/2 butter for oil or do you use coconut oil. My jar of Coconut oil is only 14fl oz to begin with so I would be using almost all of it. And do you melt it down to add it to the recipe? SAme with my zucchini bread recipe it calls for quite a bit of oil. Any thought would be great. Thanks, Kristy A.